The first issue of the Miscellany Weekly appeared February 6, 1914 as a supplement to the literary magazine, the Miscellany Monthly. 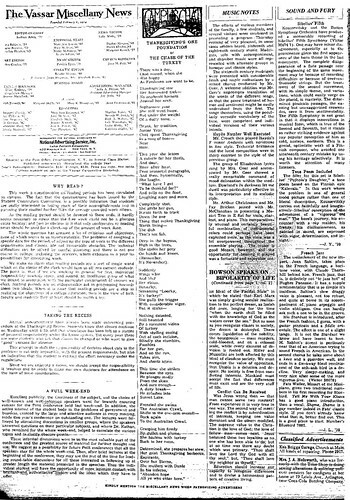 The premiere editorial, "An Old Need Answered by a New Opportunity," laid out the scope of the supplement: "It comes to answer an old need of the college for a more efficient bulletin of events and for a better means of comment than the Miscellany could afford… College life will find itself reflected in the Weekly from various angles. All events of importance to the college at large, it will try to record clearly. It will endeavor to bring events of world interest into closer connection with the college." The supplement encompassed the sections of the Miscellany Monthly known as the "back" (Points of View, Home Matters, etc.). In short, the supplement took over the journalistic aspects of the Miscellany, leaving literary submissions to the original. The first issue of the Weekly included a calendar of events, articles relying changes in campus policy and faculty, bulletins on elections, plays, and debates on campus, and opinion columns. In laying out the opinion policies, the editors articulated the Miscellany's role as a means of communication on campus, one that continues to this day. The editors determined, "To reflect current opinion faithfully, the Weekly will be a 'free forum.' It will not refuse any contribution which is authorized by the writer's signature. The editors do not hold themselves responsible for any expressions of personal opinions. If they are objectionable, the columns of the next issue are at the command of anyone who puts their objection into writing, and 'the fight is a fair one.'" As for the editorial policy, the initial restrictions determined that, "The editors will be non-partisan in playing umpire. They will hold themselves bound, as acting under the Students' Association, to an attitude of neutral, but not therefore inactive." 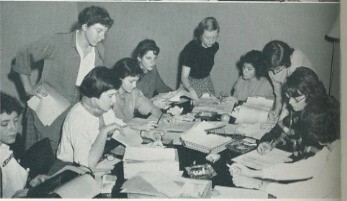 The editors of the Monthly and the Weekly worked together on editorials for the first few issues, but as the Weekly evolved, its staff began to break with that of the Monthly. The tenth issue of the Weekly included a review of the Monthly publication, a sign of the gap between the sister papers. By 1917, the only connection between the two publications was a name and a business manager. The Weekly proved itself as an autonomous publication – in 1916, issues began to be published on a semi-weekly basis, and in Feb. 1917, the paper was officially incorporated as a semi-weekly paper. 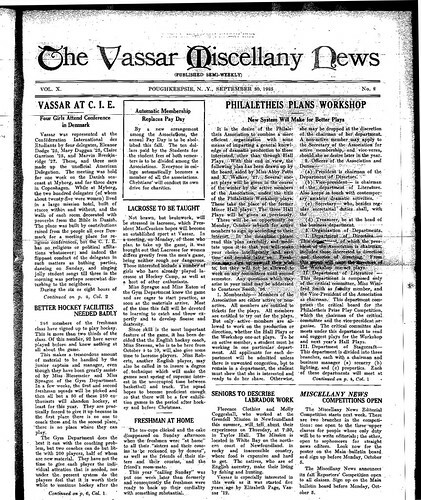 No longer a supplement, the paper needed a new name: The Vassar Miscellany News. As The Vassar Miscellany News, the paper gradually became more outward-looking. Opinion articles took on national and international events, and students became more involved, with a steady increase in letters to the editor. The paper continued to update students on the goings-on of alumnae – alumnae at that time made up audience of the college's only newspaper. In 1915, a "Foreign News" section appeared, detailing events on other campuses of Vassar's caliber. The paper was expanding, and with its expansion came a growing sense of Vassar's place in the world beyond the campus. World War I smothered the outward impulses of the paper. After the war, current events fell to the wayside, and the Miscellany News focused exclusively on campus activities. Guest lists for proms and dances featured prominently in the Misc. of the 1920s, as did exam schedules and room lists. In 1924, the members of the Miscellany staff arranged training for all new journalists, courtesy of Mr. Burges Johnson of the English Department. That same year, the Monthly broke its last ties to the Miscellany News and became Grist, a campus literary magazine. From this point until 1934, the Misc. focused upon the quality rather than the quantity of its articles, promoting high-caliber writing with such incentives as a contest in 1925 that awarded a $15 prize for the "best articles of the year." The paper continued to play around with names of various sections of the paper, recasting "Letters to the Editor" as "The Growlery" for some time, and the humorous section as "Varieties" or "Campus Chat," depending on the whim of the editorial board. The primary focus of the paper at this time, however, was on defining itself – both as an authorized Students' Association publication and also as an amateur newspaper. The January, 1928 editorial articulated the paper's position as an organ of the Students' Association: "No paper which uses the college name, deals exclusively with college happenings, comments on college problems, and is written to be read by the college can, merely by saying so, detach itself from responsibility to the college. No matter what the editors' intentions the paper will be taken and quoted as representative by outside papers. On the other hand, it would be humanly impossible as well as of questionable desirability for the News to act as an echo of campus opinion, if any. We try to hold the semi-detached status in between, not to try to say what we think the college may be thinking, but to make ourselves as representative a group as possible, on as many relevant sides as we can touch, and then to offer our honest, considered opinions for what they are worth." A page from a 1938 Miscellany newspaper, with a Vassar themed Thanksgiving poem in the center. The questions arising from the Miscellany's status as an amateur paper proved harder to come to reconcile with the perfectionists of the school. In the February of the same year, the editorial once again attempted to define the limitations and expectations the college ought impose on its only newspaper: "The News does not attempt to be professional, but exists for the training of those interested in journalism, as well as for the convenience of the college." The paper did not claim to cover lectures with previous expert knowledge of the subject under discussion, nor did it limit upperclassmen from reporting. Freshmen eligibility was restricted to Reporting Staff only because of college regulations on non-academic activities for first year students. However, the paper continued to be open to criticism, and in 1932, the editors rearranged the staffing of the paper in response to public concerns. The change created Star reporters – upperclassmen recommended by faculty who were relatively competent in specific fields and covered important lectures and events pertaining to their area of expertise. The 1932 shakeup also created further limitations on freshmen reporting. Freshmen became the paper's "cub reporters," searching out news and only writing small special articles while the sophomores dominated the day-to-day reporting. The 1932 change in personnel marked the final chapter in the Misc. identity crisis. By 1934, the paper had established its method of reporting, and the focus shifted from style to substance. World events returned to the pages of the Miscellany News. In the Feb. 13, 1935 issue, the editor-in-chief, Harrriet Tompkins, laid out a three-fold news policy that continued into the 1940s. According to this policy, the Miscellany News existed "to serve as a house organ, a means of communication for all the organizations on campus, to deal with questions affecting us as future citizens, and thirdly, it must provide a forum for the free expression of student opinion." The editorial said, "In a college paper, we feel that news should be of four kinds: the story peculiar to Vassar, that has its own individuality and campus flavoring, news of former Vassar graduates for those who still take an amused interest in us, news that brings out our relationship to other students – to that great abstraction – the youth of America, and finally, some items that throw into sharp relief the national events which have significance for us in the double role of citizens and students." Vassar was not alone in its denial of "the ivory tower" of college life. The same editorial remarked, "Students all over the country are realizing that we can no longer remain in blissful isolation or 'insulation' as the Daily Princeton puts it. The Yale News 'bids a farewell to the delusion that it is meant solely to reflect the undergraduate opinion.' And we can go down the list showing that we are not alone in our proposal to lead opinion instead of merely mirroring it." This open admission of a new approach to editorials illustrates the impact of world events on the Vassar campus – the women of the Miscellany no longer felt that they could report only campus news while their fellow students ignored the changes on the global stage. "We are in accord," says the editorial, "that there is nothing more deadening than indifference, and we will fight to the end against an apathy that negates all education." In their fight against indifference, the editors of the 1930s and '40s grappled with the same questions that faced Americans all over the country. For a decade, the Miscellany editorials and opinion pages read like policy discussions, arguing the consequences of a war or the effectiveness of Roosevelt's economic measures. Mock letters to drafted men appeared in the 1940 paper and were quickly republished in the Princetonian and the Harvard Crimson. Before and during World War II, the Miscellany News transformed into an external paper, concentrating on national and international issues instead of campus events. In response to criticism that the paper was ignoring its primary function as a relater of campus news, editor Tompkins replied, "The college has a happy talent for preserving the even tenor of its ways and of remaining unmoved while the world crashes around its head. That much of the news has been of a political and social nature, we recognize fully, but we cannot agree that we have missed campus happenings. Such news is merely less spectacular." "All Vassar College once a week Reads the MISC the truth to seek. It's got the news, it's got the style But twice a week it's got its trials. Chorus: (with feeling) Miscellany, Miscellany You get no sleep with the Miscellany News. The stories come in Sunday night With many a phone call and many a fight. We sit around, compose, rewrite, By two A.M work's still in sight. Eighteen eighteen banner head Count little spaces until you're dead It's got to be active, heaven sent, "Get another word that means 'present.'" Monday night is best of all When everybody's on the ball. We inch, we cut, we chop to bits Are we surprised when each piece fits! If this you feel is the life for you There's plenty of things that you can do. Be an editory – handle news or features – Come down to see us and we will greetchas! When campus events were mentioned, it was often with an eye towards improvement. The Miscellany led many campaigns on campus during this era, crusading for, among other things, new curriculum, reduced scholarship funds, and black students at Vassar. The Miscellany voice seems to have helped – many of the causes championed in the editorials of the college newspaper surfaced as college changes in the news section a few weeks later. During the Miscellany News's stint as a more worldly, active publication, the reporting staff underwent yet another readjustment. In 1940, the editors developed a reporter's handbook using style-books from other college newspapers and commercial newspapers. Sophomore reporters received extra training to cover more difficult assignments, and were introduced to copy-editing and makeup. The efforts paid off – the same year, the Associated Collegiate Press of the Minnesota School of Journalism rated the Vassar Miscellany News an "excellent" publication. In 1943, the "excellent" publication returned to passive reporting after a meeting between the Joint Committee of Faculty and Students and the editorial board of the Misc.. The meeting discussed recent editorials in the Miscellany concerning the loss of a scholarship due to non-academic reasons. "As a result of this discussion, the sense of the meeting was summarized in the advice that the Miscellany News would seek to obtain from the college officers concerned, a statement of the facts and that in matters affecting the relations of the students with the officers of administration and of faculty, the Miscellany News board, like all students, would use their duly elected officers of the Students' Association to make such contacts and to initiate such actions as may be deemed advisable." After this meeting, the Miscellany News was responsible to the college community for the information in its editorials. While the decision did not officially restrict the editors, the paper noticeably changed tack, and quickly pared down its activist stance. In response to the controversial meeting, the 1944 editorial staff created a committee to "study the organization and workings of college papers comparable to the Misc., to criticize our reporting system objectively in light of their findings." An editorial explained the structure of the Miscellany editorial board: "Outside a few established rules, we experiment and adopt what works. Elections to the board and to the reporter staff are made impartially: tryouts are identified by number rather than by name to prevent any discrimination. Senior editors rotate as managing editors, to bring forward a variety of fresh ideas, and to share responsibility and experience. The editor-in-chief- is elected by a unanimous vote of the editorial board." The committee's findings were compared to the current methods, and the editors agreed to try any recommendations. The 1943 meeting was the first official conflict involving the weekly paper, and it clearly shook up the Miscellany editors. A self-consciousness pervaded the paper for much of the 1940s as the paper attempted to regain its confidence, and during this era, the paper returned to experimenting with new columns and fonts instead of topics. Another factor in the 1944 shift was the beginning of a new publication on campus. In 1944, the first issue of the Vassar Chronicle appeared on campus. For the first time, Vassar had two newspapers. The defining difference between the two papers was the editorial policy: the Miscellany continued to publish editorials that represented the collective opinion of the editorial board. The Chronicle, however, believed in expressing the opinion of the majority of campus, and to do this, often opened its editorial columns to readers. Since two newspapers competing for readership, the Miscellany focused its efforts on tightening up the campus aspects of the paper and relegated external news articles to the inside pages. For their first 19 years of co-existence, the Miscellany and the Vassar Chronicle cooperated. In 1945, they published the first of a series of joint special edition papers on major events in the world and on campus. These special editions offered diverse viewpoints on a single topic – for example, the 1945 issue focused on life in the Atomic Age. Other topics included the National Students Association and a five-day work week for students. The special editions spurred the Miscellany to begin publishing extra issues commemorating events, and a freshmen issue was introduced to welcome new students each fall. As for relations between Vassar's two papers, they were polite if not close. The two papers occasionally acknowledge each other in editorials or quotes in articles, but the references were peaceful, and the Misc. supported the existence of an alternative source of campus information. The peace broke on February 11, 1959, when a Chronicle editorial recommended that the Chronicle merge with the Miscellany News. The Miscellany response was cold. In a polite refusal, the Miscellany editors noted, "One newspaper combining the total staffs of the "Misc." and the "Chronicle" could not operate up to the standard of either existing paper. More important, the College has a right to editorials taking definite stands, coming from an editorial board that is an entity and not a synthesis of individual opinions." In the Miscellany Letters to the Editor, the Chronicle's motives became clear. The Chronicle's finances were mismanaged, and the paper operated in the red most years. The Miscellany, on the other hand, adeptly handled its accounting, and issued its weekly papers without accruing any serious debts. The Chronicle, perhaps insulted by the Misc.s refusal, continued to press the issue in its own editorials in less-than-polite terms. For a time, the editors of the Misc. devoted their editorials to corrections of misstatements in the Chronicle. Finally the issue came to a head, and the Faculty Committee and the student body proposed that there be one college newspaper. They placed the issue on the trustee ballot, but the trustees on the Committee on Undergraduate Life decided not to take action, and the issue died. Any mention of the Chronicle disappeared from Miscellany pages, even though the Chronicle continued until 1978, and the joint special editions were cancelled. The 1951 Misc. Staff hard at work. With the end of the Chronicle misadventure came another rise in Miscellany activism. In the Freshmen Issue of 1961, the Misc. board said, "The Misc. is what is known as a Living Newspaper. An interest in current affairs which began as a crusade for Women's Rights, is seen today in editorials on national and international events of importance, and articles and counter articles on issues vital to students. Mostly, however, the paper is noted for its attitude symbolized by the slogan 'Once Again We Protest.' meaning that the Misc. believes that anyone or thing (such as Vassar College) that has ideals should live up to them, and that the Misc. will not hesitate to point out flaws which can be corrected." The previous coverage of campus events like lectures and concerts now became reviews and commentary. In 1963, the Misc. created a new method of communication on campus – classified ads starting at a dollar a column inch. The paper of 1965 recognized the passivity of the 1950s Misc., saying, "In the past, the Misc. has acquired the reputation of being a timid, dry, and generally boring anthology of notices from the News Office. Despite an improvement in the last two years, most Vassar students (and faculty) continue to think of the Misc. as the journalistic equivalent of the "Congressional Record" – informative but not enjoyable reading." The 1965 paper had a new look thanks to a change of printers, including a less formal layout, longer pages, and more pictures. Cartoons began to appear in the paper, as well as entire columns devoted to satire and comedic writing. Alongside its more engaging visuals came a more independent mindset. No longer did the Misc. feel responsible to the Students' Association or the College for its articles. Rather, the paper began to seek out conflicts with these bodies, taking on a new role as watchdog over campus institutions. A 1967 editorial rationalized this new attitude towards the college: "At times we may seem brash and out-spoken; at times we may seem overly demanding, even 'revolting.' But beyond the annals of the college, beyond being merely a newspaper of record we are a political instrument for change. We can accomplish our goals on campus and perhaps we can inspire students to work for social change and progress off-campus." The Miscellany News. 1914-1969. Vassar College Library.